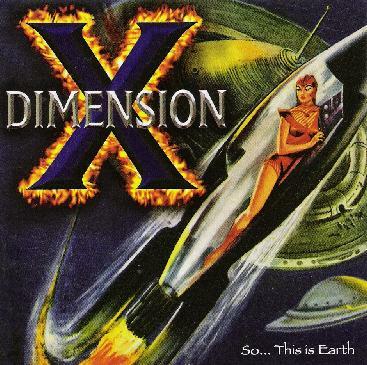 Dimension X - "So… This is Earth"
Dimension X are a guitar/bass/Chapman Stick/keyboards/drums/vocals quintet from Milwaukee, Wisconsin who play a hard rocking brand of progressive rock with heavy metal influences. Vocalist David Hoover II's voice and singing style is similar to Echolyn's Ray Weston, which often reminded me of that band. But musically Dimension X much different. Lots of what I hear is balls-to-the-walls rock and metal but intricately composed and structured and played by crack musicians. "Open Letter" is great example of a song with varied influences. The guitar and rhythm section blast through heavy metal jams while piano plays a fiery classically influenced run. The song is less than 4 minutes long but Dimension X manage to speak volumes in a short amount of time. "Corporate Ladder" is a hard rocker but without the overt metal influences. It's much more keyboard heavy and full of the classic prog sense of drama, and is a genuine instrumental and compositional powerhouse. "Train Wreck" is similar, bringing back more of the metal, but this is also one of the bands most exciting songs, full of instrumental gymnastics that showcase Dimension X for the tightly knit ensemble they are. And at 17 minutes, "Xeno's Paradox" is an outstanding piece of music that bears all the hallmarks of epic progressive rock. The band shifts through multiple varied themes and each musician gets an opportunity to show his chops, though there's no soloing per se… it's all within the context of the larger song. Wow, this one will take your breath away. In summary, fans of accessible but sophisticated progressive rock will find much to drool over with this album. Their sound is by no means new and there's nothing about Dimension X that gives them a character of their own. But in terms of musicianship, composition and performing as a tight ensemble, these guys have got it down to a science. For more information you can visit the Dimension X web site at: http://www.dimensionxproject.com.